When looking for the perfect pizza recipe online, it is hard to find a more convincing sounding address than www.pizza.it. And the recipe I discovered there certainly lives up to the site’s name! The site contains a section on how to make pizza of restaurant quality at home. It seems that the recipe that I originally used has been replaced by an even more professional looking one. Maybe I will give that one a try as well but in the meantime, I’m sharing my original discovery of the site. As I mentioned in my previous post about pizza, there are several tips and tricks that take you closer to that pizza perfection. 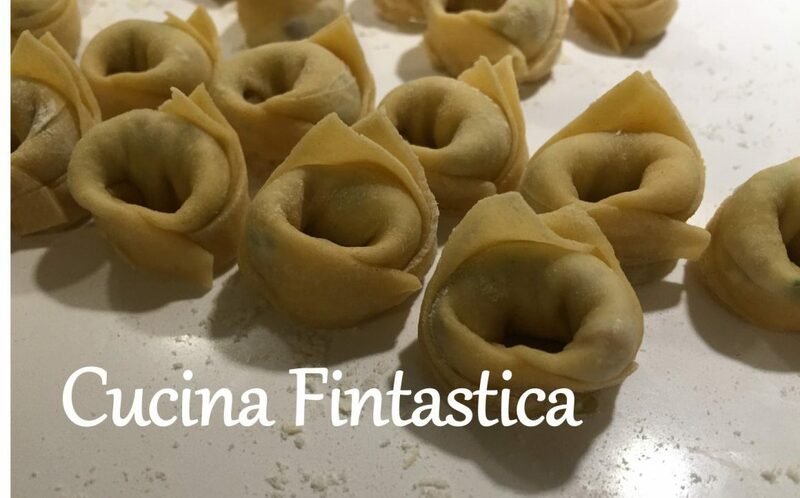 In my experience, the most important one is pazienza – both to knead the dough properly as well as to let it rest and rise for hours. In this recipe the kneading part is even more important (and a lot more time-consuming) than in my earlier pizza recipe. If you have an electric mixer at your disposal, I am sure you can speed up at the process. However, with my limited baking skills without the modern technology, it takes me almost an hour to knead this dough sufficiently. It also seems that the dough certainly improves when you store it in a fridge overnight. Another critical component of your pizza success is cooking. This recipe contains a couple of tricks on how to imitate the impact of a proper pizza oven in case you do not have one at home (as is the case for the most of us I presume…). I have also noticed that sometimes the difference between a nice pizza and a fantastic one is about one minute in cooking time. Divide the flour into two equally sized portions. Mix the yeast in 1 dl of water. Combine the yeast water with one half of the flour. Knead thoroughly until you have obtained a smooth dough with some elasticity (at the beginning this may seem like an impossible task with the smallish amount of water but miraculously you will get there after some persistent kneading!). Mix the salt in 1 dl of water and combine it with the other half of the flour. Knead again thoroughly to obtain another dough of similar consistency to the one with yeast. Finally, combine these two doughs and knead even more (at this point, you may consider never making this pizza again, but trust me, you will change your mind after having the first bite of the end result!). The ready dough should be smooth, slightly moist, soft and elastic. 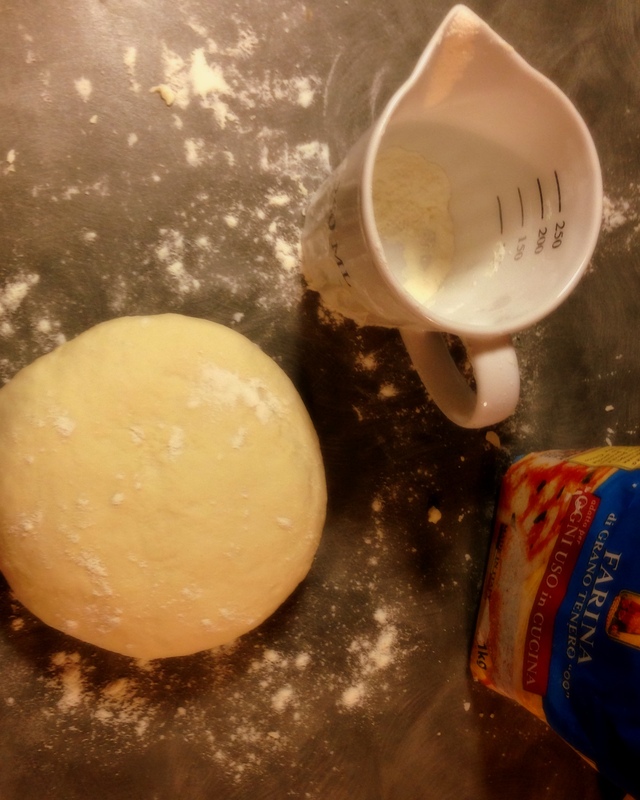 Store the dough in a fridge overnight (you may skip this step if you have lost your pazienza already at the kneading phase but this does improve the quality of your dough). On the following day, take the dough back to the room temperature (+23 C) and let it rise for 3 hours. Place an oven tray into the oven and preheat the oven to its maximum temperature (I have used 250C). Roll out the dough into four large and thin rounds, using a rolling pin. Top the pizza bases with the tomato sauce. Place a pizza base on a parchment paper and move it to the hot oven tray. Bake it in the oven for 8-10 minutes. Take the pizza base briefly out of the oven and add the mozzarella di bufala and potential other toppings of your choice and drizzle it with some olive oil. Continue cooking the pizza for another 4-7 minutes. As mentioned in my introduction of this blog, there is one thing that I’m slighty obsessed with in the Italian kitchen: the perfect pizza. It seems that I am not alone. At least in Italy. My most recent experiment is from the website of Corriere della Sera. The recipe proudly promises to unveil the secret of the perfect pizza – a claim which has certainly sparked quite an intensive debate in the comments section of the recipe. As also mentioned in my blog intro, I am not exactly skilled in the field of baking. I have some less fortunate incidents in my past, such as burning some parchment paper (and the pastries on it) in the oven. Or heating the oven to 250 degrees as instructed in a Martha Stewart recipe, only to discover later – after having an end result resembling coal – Martha, being an American, obviously meant 250 degrees Fahrenheit (~100 Centigrades). But when there’s a will (which there certainly is to bring this missing piece of Italy to my little kitchen in Helsinki! ), there’s a way. And if I can do this, so can you! The first challenge of following an Italian pizza recipe is conversion. The good news is that there are no fire hazards similar to the M. Stewart incident. However, it seems that an Italian always makes a pizza recipe with the intention of feeding an entire famiglia. In a Finnish city environment, this would probably be an equivalent to a couple of staircases of an apartment building. I wanted to make this pizza for two people but 1.8 kg flour sounded somewhat excessive for us and the recipe doesn’t give any indication on the amount of servings. In the comments section of the Corriere article, someone (sounding sufficiently street credible) instructed to use slightly less flour than in the recipe if you don’t have a proper pizza oven at your disposal. I followed his advice and decreased the amount of flour to 1.6 kg. After that I divided all the ingredients by four and miraculously ended up with a serving just right for hungry two. And yes, this recipe certainly is at least a strong candidate for the perfect Italian pizza! – Preparing a proper Italian pizza takes time. You should take your time to properly knead the dough and reserve hours (at least 8-10 in this case) for the dough to rise. Many recommend that you first store the dough in a fridge over night. After that you still need to let the dough rise for those 8-10 hours. – The flour you use makes a difference. Italians and I use a finely ground type “00”. If not available, it is often proposed that you substitute it with durum wheat flour. – The amount of yeast used in real Italian pizza is miniscule compared to many “less authentic” recipes. I suppose the Italian pizza has been modified by the less patient Finnish, American etc. bakers by substituting the long rising time with yeast. You should also always use fresh baker’s yeast for the Italian recipes. – When it comes to cheese, there is no real substitute for mozzarella di bufala. And obviously the perfect tomato sauce is yet a completely different matter. In fact, so different that I will dedicate a separate posting for it! Pour the water into a bowl. Add the salt and stir with your hand until the salt has dissolved into the water. Drizzle 10% of the flour into the salt water and continue stirring for a few seconds. Add the yeast and mix carefully. Continue adding the remainder of the flour by drizzling it and mixing it with rotational movement. Once all the flour is included in the dough, place it on a table. Continuously knead and fold the dough. Continue until the dough is smooth and not sticky (this should take at least 10 minutes). Cover the dough with a damp towel and leave to rest for two hours. After two hours, divide the dough into two blocks (about 200 g each). Cover both blocks with a dry towel and let rise for at least 6 hours. Roll out the dough into large rounds, using a rolling pin or your hands. Add the tomato sauce, mozzarella di bufala and other toppings to your taste. Remember that less is really more when it comes to pizza toppings! Sprinkle some olive oil on top. Bake in the oven at 200 Centigrades for about 15 minutes.